Die Winterreise is one of the most desperate pieces of the composer. Schubert probably identified himself to the traveller, wounded by a love unshared. These poetries tell the story of a lonely traveller in the middle of the winter and raises existential issues. Müller’s texts are almost a poetic autobiography Schubert. Thomas Bauer studied the power of words and music… and found with Jos van Immerseel a partner able to bring emotional background thanks to his mastery of forte-piano. 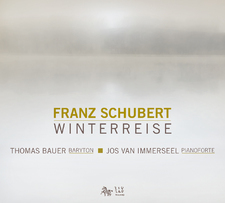 Thomas Bauer made himself an initiatory travel along the trans-Siberian Railway between Moscow and Pekin where he sung this Winterreise.